Irwin Allen did quite a few disaster movies (The Poseidon Adventure, Airport) that were commercial, if not always critical, successes. 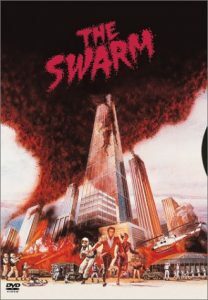 The Swarm, in contract, was a flop both commercially and critically — and a massive waste of some very good acting talent as well. Something else that needs to be mentioned are the special effect — in and of themselves, they’re not bad, but they are unrealistic. For example, a train derails in the movie — and all of the train cars, that carry no fuel, explode. The bees have near-human intelligence, and a nasty streak as if they were graduates of the Sauron Institute for the Criminally Vicious. They start by attacking a nuclear missile silo, and go up from there. Richard Widmark – the military man who wants to simply destroy the bees, but Caine keeps vetoing it because of the “ecological disaster” that would ensue.